When many gamers even those who love classic gaming thing about the first commercial home video game console they think the Atari, but it was in fact the Magnavox Odyssey. Released in August of 1972 it pre-dated the Atari Pong console systems by three years. You can find our reviews on the various games for the Magnavox Odyssey here. With Gunfighter you took control of, unsurprisingly, a Gunfighter in the old wild west. 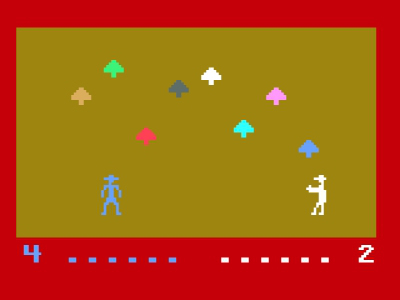 Each player was represented by about twelve sprites, with a couple of sprites representing the mandatory cowboy hat. You moved about the screen, firing your one sprite gun at your opponent and the one sprite bullet would drift across the screen, usually missing the other cowboy and bouncing off… things – not quite sure what they were, stones? Cacti?